From the "I told you so files"
As Yogi would say, "it's deja vu all over again"
Fresh on my post about how disappointed I was to see Jib Jab brown-nosing up to A-B and using their real estate to hawk Bud's corporate wares, is this consumer generated content special which raps J-squared on the knuckles. 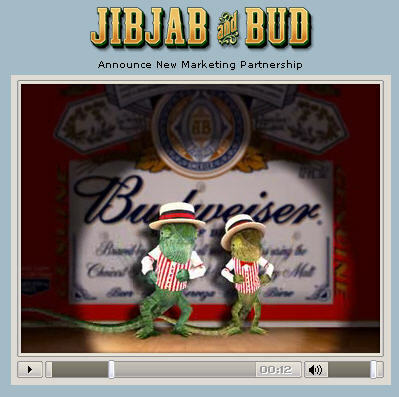 Now - and here's the catch - if this is in fact an underground attempt by JibJab to poke fun at themselves, then I would call this act of irreverence ingenious as far as JibJab is concerned, but a little troubling with respect to any associations with the Budweiser brand. Forrester Research is predicting an ad-spending downturn to hit in 2007, when more than 50 million U.S. households will be using either digital video recorders or video-on-demand services. The number of households subscribing to personal video recording services has grown to 9.2 million, up about 155 percent from a year ago, according to a new study from In-Stat. It's almost like witnessing an election debate or sitting on the jury of a courtcase where two sides blatently contradict each other. Who will you vote for? Which side is lying? Will the Jury unanimously convict and hang, or will they be torn and hung? I've taken a bit of time to visit the site, "spicyparis", viewed the commercials etc and here is my "critique" if you will have it. I was interviewed for this week's Business 2.0 Marketing Focus, titled Beer Buzz, on the subject of Budweiser hiring Jib Jab. While I thought the idea to hire this edgy production company for a large brand was a great idea, I was a little surprised in its execution. For starters, I never expected to see it front and center on jibjab's homepage (SELL OUT), nor did I expect the hokey "JibJab and Bud" marriage to be so overtly and uncomfortably prostrated in front of our faces. The creative itself is also a little sub par - I couldn't work out if this was meant to be an ad or not? What was the point other than "to inform" (very old marketing) us all that more commercialized messages was to come? 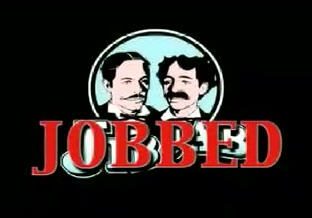 Whoopdi-friggen-doo! Penn & Teller have made Vegas their home. It's a place where it's ok to construct false realities, fool people with illusions and trickery and ultimately con people out of their money using "legit" (read: casinos) and illegit techniques. 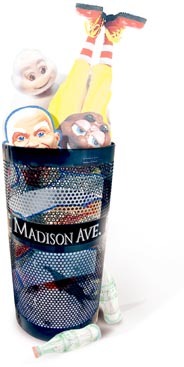 Unfortunately FCC commish, Jonathan Adelstein doesn't quite buy into Madison + Strip(tm) yet and for this reason, Burnett and his Madison Avenue Cronies might find that their celebrations could be a little premature. Bottom line, Adelstein is putting his foot down at the "commercialization of media" and the use of "covert commercial pitches" with respect to product placement et al. Can you imagine how laughable it would be to have little "advertorial" type stickers on all paid placements on TV? Might as well put a big "L" sign on all participating brands or a "kick me" label, alongside the "PG" rating on all content. Church and State are no more. Editorial and Sales are truly one and the same, are they not? Television calls it product placement or branded entertainment and the Print version is a Willy Wonka children's panacea where only nice things are said to nice people; a place filled with warm and fuzzies, love and kisses, candy lollipops and butterflies. Segue to BP's announcement (hot on the heels of Morgan Stanley) of a "zero tolerance policy towards negative editorial coverage" to quote a memo which was sent around by BP's media agency, Mindshare. By my count, this is the third company to do something along these lines..the first being GM and their little spat with the LA Times. According to the article in Ad Age, a source indicates that magazines are not in a financial position to buck this demand from advertisers and therefore, this trend will continue. This is downright shameful. It's disgraceful. Mindshare should be embarrassed that they are playing the role of client lackey (the memo to print pubs was on a Mindshare letterhead) and forgive me if I shoot the messenger, but bang bang bang. Some believe that "no news is good news", whilst others content that "it's better to be talked about than not at all" - whichever position you hold, it's irrelevant. Integrity of editorial product is paramount and the protection of content is sacrosant. BP/MS/GM - you guys have to grow up, I'm afraid. You gotta roll with the punches and take the good with the bad. If you don't, you may be looking at a rather anemic looking media landscape. Note to jaffe Juice readers: Upon reading this rant, I was informed by Mindshare on behalf of their client, BP, that BP would no longer be advertising on the blog. ESPN released a study at the Cabletelevision Advertising Bureau's local sales management conference which essentially stated that DVR's might not exactly herald the end for the status quo stalwarts. 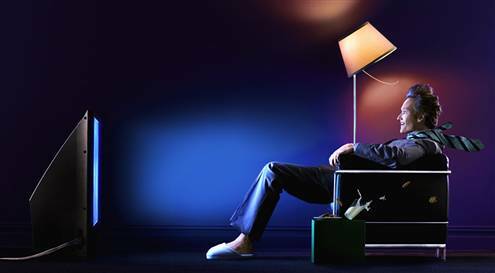 In their "study", 57% of so-called "late adopter" households that participated in a DVR study returned them because "they did not want them"
The digital set-top devices clashed with or didn't fit into their home furnishings. Furthermore, of the 67 who kept the magic boxes, there was an "indication that they continued to view TV commercials, even during fast-forward mode." I'm not going to go into the usual rant about the self-evident self-serving aspects of the study, which just seem too convenient. What I will say however is that the operative and integral phrase is "late adopter." This study was out of context - DVR's and their value proposition are no where near the late adopter stage of the diffusion/adoption curve, so asking 34% of consumers what they think about a ship that has not yet docked at their port is just downright irrelevant and inaccurate. If anything, the fact that 43% of late adopters elected to keep their DVR's should unequivocally make Madison Avenue more anxious and paranoid. The sun will come up. Tomorrow. But maybe not for you. Good morning from the 7th floor of my hotel room at the Amelia Island Plantation Resort about to begin day 1 of the iMedia Summit. As I start out the beautiful calm ocean and watch the sun rise, I am heartened that a new day has dawned – quite literally and certainly figuratively – on marketing; a new reality; a new marketing reality. You should read it. So should every agency person in the business. Note to SE: Nice cover image. Not sure you’ll be invited to Advertising Week this year, though.